Our friend Jenn of The Artist’s Eyes is a fantastic artist. 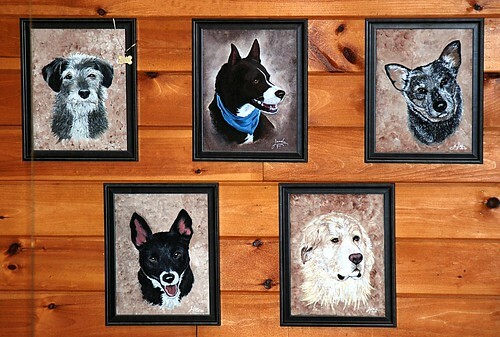 We asked her to paint portraits of all of our pups, past and present, and she did a fantastic job! She perfectly captured each dog’s personality! She had painted Rudy’s portrait for us last year and completed the rest of the crew for us recently. Jenn makes all of her art ECO friendly (environmentally friendly), which is always a plus! Check out her site and portfolios – she does more than just painting! I framed all of the portraits in matching frames and hung them on the large wall so that they are the focal point when entering the house (or sitting anywhere in the living room, dining room and kitchen for that matter). Here is a picture of the portraits after they were hung. They are hung in order of when we got each dog. Hardy and Rudy, the first two, are no longer with us. I am hanging their tags on the corner of those portraits with ribbon in honor of them. I have Hardy’s tag up there now, but have not yet located Rudy’s tag since we moved, but I will! Blue, Lois Lane and Buddy (aka Giant Dawg) are the others three pups. Another Beast of an Egg!